On February 8, 2012, Congressman Edward Markey (D-MA) took to the floor of the U.S. House of Representatives to introduce the Smarter Approach to Nuclear Expenditures Act (H.R. 3974). This SANE Act would cut $100 billion from the U.S. nuclear weapons budget over the next ten years by reducing the current fleet of U.S. nuclear submarines, delaying the purchase of new nuclear submarines, reducing the number of ICBMs, delaying a new bomber program, and ending the nuclear mission of air bombers. Since its introduction, the SANE Act has picked up significant support. 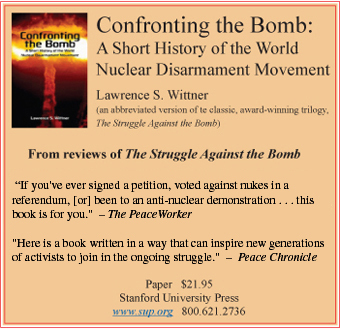 Not surprisingly, it is backed by major peace and disarmament organizations, such as Peace Action, Physicians for Social Responsibility, the Friends Committee on National Legislation, the Nuclear Age Peace Foundation, and the Ploughshares Foundation. But it has also attracted the support of the National Council of Churches, the Project on Government Oversight, and the Congressional Progressive Caucus. Indeed, the SANE Act now has 45 Congressional co-sponsors. The real nuclear threat to the United States does not lie in the fact that it does not (or will not) possess enough nuclear weapons to deter a nuclear attack. Rather, it is that there is no guarantee that nuclear deterrence works. That is why the U.S. government is so worried about North Korea possessing a few nuclear weapons or Iran possibly obtaining a few. That is also why the U.S. government squanders billions of dollars every year on a “missile defense” shield that is probably ineffective. The grim reality is that, if governments are reckless or desperate, they will use nuclear weapons or perhaps give them to terrorists to attack their foes. While nuclear weapons exist, there is always a danger that they will be used. Thus, what has made the United States safer in this dangerous world has not been piling up endless numbers of nuclear weapons but, rather, nuclear arms control and disarmament agreements. The Nuclear Non-Proliferation Treaty, for example — by trading promises of the nuclear powers to disarm for promises of the non-nuclear powers to forgo nuclear weapons development — has persuaded the vast majority of nations not to develop nuclear weapons. In this fashion, the willingness of the U.S. government to decrease its nuclear arsenal (something it has done, although reluctantly) has made Americans safer from nuclear attack by other nations. As a result of patient U.S. diplomacy, even the leaders of North Korea, one of the worst-governed countries in the world, seem to have shown glimmers of sanity in recent weeks. In late February, they announced that, thanks to an agreement with the U.S. government, they would suspend nuclear tests and uranium enrichment, as well as allow international inspection of their nuclear facilities. If even the government of North Korea can manage to display a measure of common sense, then is it too much to ask our own government to do the same? Our leaders in Washington could join Representative Markey and his Congressional allies in cutting back the U.S. government’s vast and expensive nuclear doomsday machine and using the savings to provide for the needs of the American people. Surely it’s time to try a little nuclear sanity.